Open Recent. A sub-menu listing recently used Tinderbox files. The list holds up to a (default) 10 filenames; the maximum list size can be changed via the config.xml file. Share. 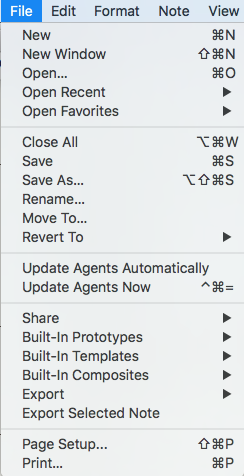 Opens a sub-menu of Sharing options. If some note(s) are selected, those notes will be shared with compatible programs. If no notes are selected, the Tinderbox document itself will be shared. The options listed in the sub-menu will depend on the range of apps/services installed on the Mac's current user account. Built-in Composites. Opens a sub-menu listing a choice of built-in Composite sets of notes that can be added to the current document. Export Selected Note. Opens a dialog for exporting individual notes (defaults to $HTMLExportFileName).